I have been trading with FxPro broker for the past 3 months and everything is ok. I have made my first withdrawal of my profit trouble free. Their quote is ok. It is only once a while that you see a re-quote. Take Profits and Stop Loss orders is ok as always. Please if you want to trade with FxPro, please go on and open an account they are good broker and regulated by CYSEC, Cyprus. There customer service is excellent. They are indeed a first-class broker. Negative comments are from beginner traders who do not know how to trade forex. Harmful comments may be too from their opponents. I have started my trading with FxPro opening an account with them since 2010 and right until now, I am still trading with them. Yes, I got some re-quotes during instability market periods but I can handle that because I do not trade following scalping strategy. Their withdrawal is quick & swift; it takes 2 days only to send back money to my bank in Malaysia. In terms of spreads, I can tell it is amount the best for market maker brokers. For example, GBPUSD usually is between 1.8 to 2.0, never rises to 3 pips. GBPJPY between 3.0 to 5.0pips. They are not a Scam broker. Experience it yourself. admin, my question FxPro accept PayPal ?? I trade in fxpro for half a year. Everything is ok. The spreads are quite low. No problems with the connection and execution. The orders open and close without large slippages. Withdrawals are in 1-2 days. To my mind, FxPro is a good broker with which everybody can work. Really good broker. Have a lot of friends working with FxPro. All of them are completely satisfied. Tight spreads, highly developed platforms, PayPal and skrill available, professional customer service, zero-problems order execution – a lot of benefits. It fits perfectly for me and my expectations. I am looking for a good and reliable broker. Now I tend to FxPro. I enjoy their web-site. It is very informative and I find a lot of interesting materials here.Also I like their support. Manager was very polite and explain me all conditions in details. Two weeks ago I started to test their Ctrader demo account. It really pleased me, but I want to inquire about execution on life account before open it. Can anybody who works with FxPro explain me the difference in execution between real and demo accounts? I would like to try trading with FxPro, but I’m still worry a little, because there are a lot of scammers on the market. Reviews are quite contradictory. I heard mostly good things about them. Basically, that they offer comfortable demo accounts, fast execution and withdrawals.Who actually works with them for a long time? What can you say about this broker? First broker, i’ve made first good money with. Maybe i was unlucky before, maybe i just became more professional. But this is fact. And When i made this money my withdrawal attempt was successful. No fraud, no manipulation. After this happen i realised FxpRo is totally reliable. Maybe one of the most reliable brokers nowadays. Extremely fast deposit/withdrawals via PayPal, instant execution, real negative balance protection and many instruments are offered. The only issue: sometimes in very volatile moments, they could have better server response, but this is happening with many brokers. I have mostly good experience with Fxpro! Have been dealing with them for a year. So far no incidents. Fxpro regulated in several different jurisdictions. They provide a good range of trading instruments and modern platforms. Also, they have very convenient app for mobile trading. Spreads on majors are really good in contrast to other regulated brokers. No problem with the withdrawals. Highly recommend! FxPro (website) – Forex broker. Owned and operated by the FxPro Group. FxPro is a forex and financial services brand that has been unbundled over the years to operate out of Cyprus, the UK, Australia and other jurisdictions. Has Offices in Australia, Cyprus, Russia, United Kingdom. This forex broker offers Segregated accounts, Affiliate program, Islamic accounts. FxPro Minimum deposit = $500. FxPro offers Free VPS for VIP-clents. FxPro UK Limited, which is in charge of the UK operations as well as services to the English speaking clientele of FxPro, is regulated by the Financial Conduct Authority (registration no. 509956). FxPro Financial Services Limited operates out of the company headquarters in Cyprus and is authorized and regulated by the Cyprus Securities and Exchange Commission (licence no. 078/07). 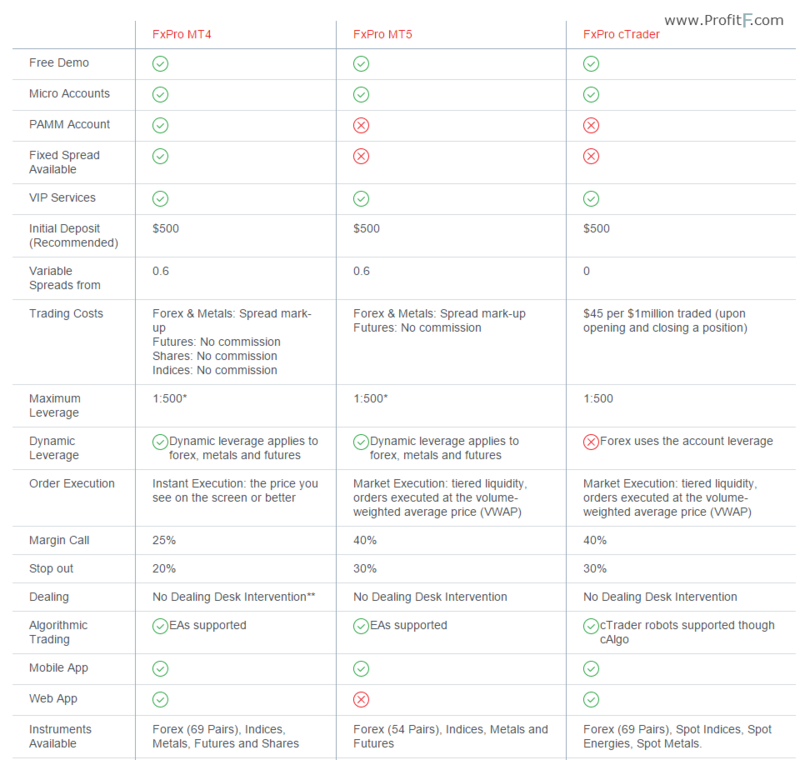 Traders on FxPro are offered a choice of 9 trading platforms. The trading platforms cover desktop clients, web-based platforms and mobile trading platforms. Webtrader: This is the web-based platform which is based on the MT4. MT4 Multi-terminal, which is used for management and trading of multiple accounts. This platform was specifically built for account managers. iPhone Trader: This is the mobile trading app for the iPhone. iPad Trader: This is the mobile trading platform, built as an app for the iPad. aTrader: This is the Android FxPro trading app. bTrader: This is the BlackBerry trading app. cTrader and cTrader Web are the ECN platforms for desktop and web-based trading on FxPro. cAlgo: The cAlgo platform is to enable traders to construct and test algorithms for use on the cTrader platform. No other retail brokerage firm offers up to 9 trading platforms for the usage of its traders. A demo account for practice trading. 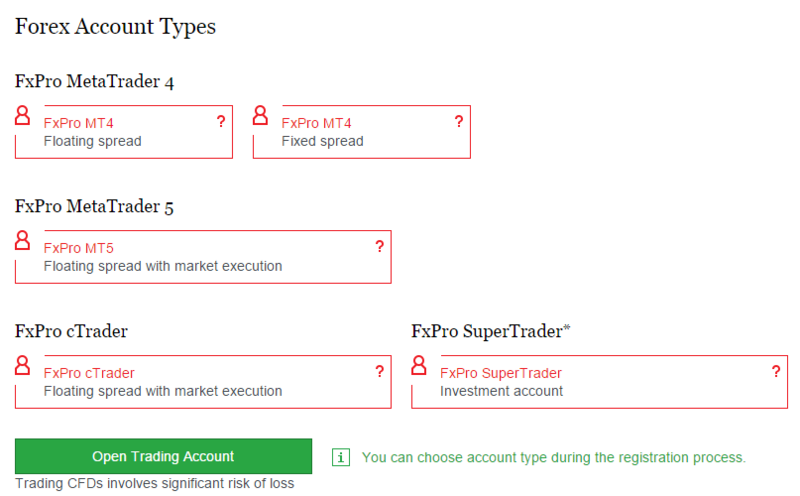 SuperTrader investment account which is for passive investors who want to copy strategies from other profitable traders on FxPro. A PAMM account which allows the investor access to a professionally managed portfolio account. cTrader account, which is the ECN account type on FxPro. This account gives traders access to the cTrader and cAlgo platforms. Skrill: Deposits are processed in 10 minutes and withdrawals within 1 working day. Credit/Debit cards: Cards accepted are VISA and MasterCard. Deposits are processed within 1 hour and withdrawals within 2 working days. For first time withdrawals, traders must supply a copy of the card with the 3-digit security code and card statement for verification. 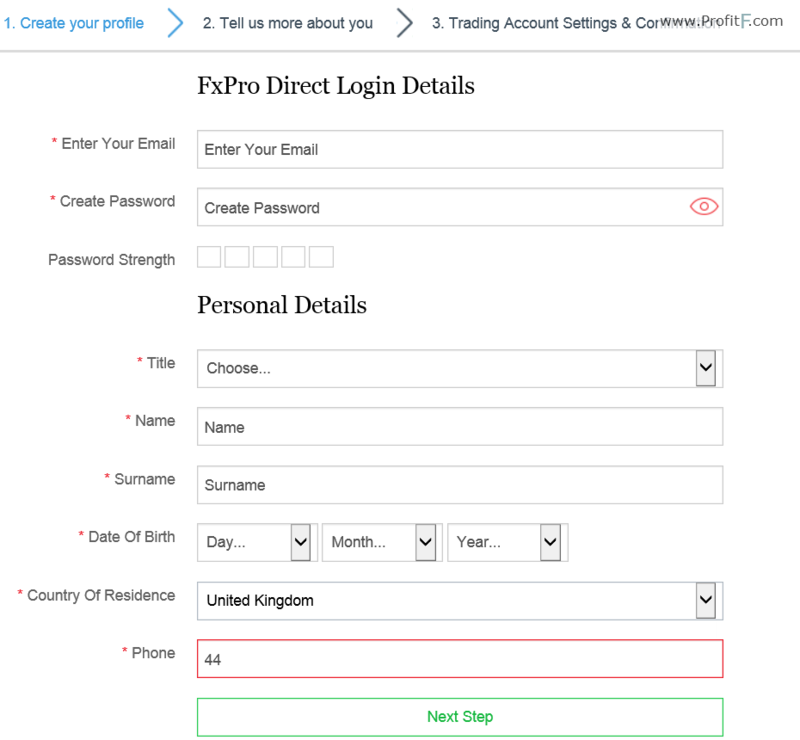 Bank wire: Usually takes 3-5 working days to arrive into FxPro’s account for onward transfer to trader’s account. Withdrawals take the same time as well. Neteller: An e-wallet option. Deposits are processed within ten minutes and withdrawals are processed within 1 working day. China UnionPay: Deposits take 10 minutes while withdrawals are processed within 1 working day. This method is for exclusive use of Chinese clients. FxPro now permits the opening of micro accounts which allow a standard minimum trade size of 1 micro lot. The Classic account variation still comes with a $500 minimum deposit. Now, everything seems OK with FxPro broker however “ProfitF team” will keep monitoring this broker and update this review if any changes take place.